Chi-Ka, a joint fashion venture founded by a Dubai couple namely Nemanja and Nina Valjarevic. 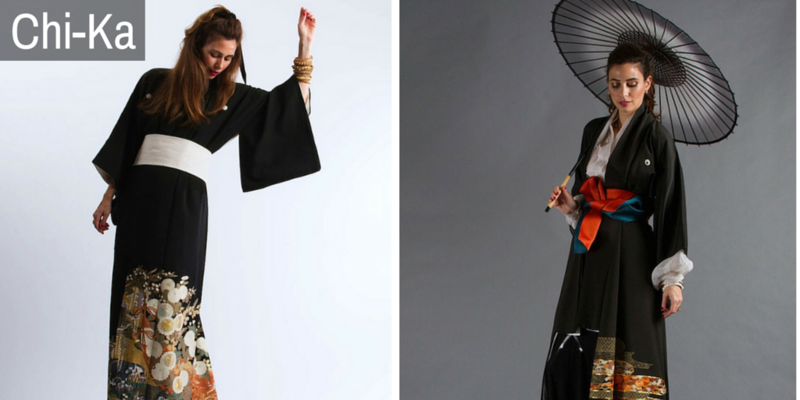 With this fashion brand Japan meets Arabia through exclusively designed handmade kimonos. The brand came about as a result of fascination with Japan and Japanese culture which provided endless source of inspiration. The combo of Arab and Japanese culture further strengthened the two nations via fashion. These beautifully hand crafted kimonos took months to complete. Each robe is one-off and can be worn as a robe. The Kimonos have received greater appreciation from the Arab customers. The kimonos adapts perfectly to Khaleeji sensibilities of modesty and femininity. Chi-Ka has recognized the similarities between traditional Japanese and Middle Eastern fashion. Despite the infinite variety of colors, ­textures and styles the Japanese kimonos come in, the original conservative and modest cut remains, hiding all but the basic form of the wearer, similar to that of the abaya. Tradition is woven into modern Japanese fashion as it is with Middle East fashion. The Eid collection 2015 is revealed where Chi-Ka is constantly involved in introducing something new to the classic abaya, while at the same time in contributing to keep the art of kimono alive. The designs are created by working in close collaboration with kimono specialists based in Japan to identify local artists and craftsmen, both well-established and new names. Kimono prices vary depending on which craftsman has worked on them. The Chi-Ka collection ranges from Dh 2,500 to Dh 3,500 for the kimono-abayas, Dh 1,500 to Dh 3,000 for silk kimonos, and Dh650 for silk kimono jackets. Chi-Ka bringing something highly unique to the market. Our kimonos and ­kimono-abayas are all one-of-a-kind, meticulously sewn, painted and ­embroidered by hand. Genuine kimonos are works of art, and each piece takes months to complete. Exclusivity has become a sought-after quality in the abaya market across the region and Chi-Ka outfits are exclusive in the sense that the design will never be repeated. More gorgeous pure silk kimonos in different colors and patterns, new accessories, and a kid’s kimono are in line. Revolutionize your Eid with a glamorous tint of Arab-Japanese combo of Kimono.